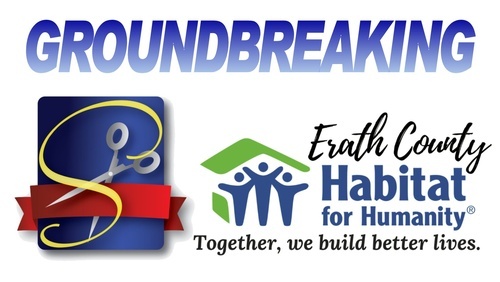 Please join us for a Groundbreaking Ceremony for Erath County Habitat for Humanity as they begin construction on their 20th home! Come meet the ECHH board of directors and building project partners and get information on how YOU can help. Erath County Habitat for Humanity (ECHH) builds houses in partnership with qualifying families, using as much donated materials and labor as possible. Materials must be new and unused to provide the best quality for the families. ECHH then sells the houses at no interest and no profit, making them affordable for many low-income families. The monthly payments that are made by Habitat homeowners go toward building homes for new partner families. Click here to learn more about Habitat for Humanity and find links to their website and social media. Click HERE to sign up to receive emails about volunteer opportunities! From North Graham Street, turn West on Frey, then North on Belknap, then East on Walnut Street. Property is in the middle of the block between Belknap and Columbia. Parking is available in the two lots adjacent to 244 W. Walnut as well as along the street.